Just as Lady Gaga dressed up as her alter ego “Jo Calderone” at the VMAs on Sunday, many other women have dressed as men in film. Whether it be taking a full male role or dressing up in disguise, here are 10 women who have worn the pants. 1. Hilary Swank As Brandon Teena In "Boys Don't Cry"
2. 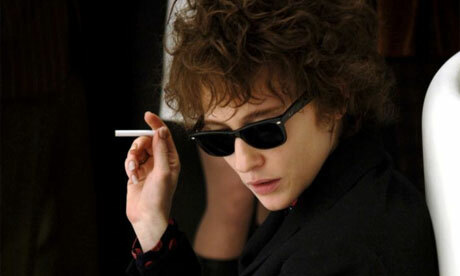 Cate Blanchett As Bob Dylan In "I'm Not There"
3. Amanda Bynes As Sebastian Hastings In "She's The Man"
4. Katharine Hepburn In "Sylvia Scarlett"
5. Angelina Jolie In "Salt"
6. Gwyneth Paltrow In "Shakespeare In Love"
7. Barbra Streisand As Anshel Mendel In "Yentl"
8. Julie Andrews As Victor In "Victor/Victoria"
9. Julia Roberts In "Sleeping With The Enemy"
10. Cameron Diaz And Drew Barrymore In "Charlie's Angels"